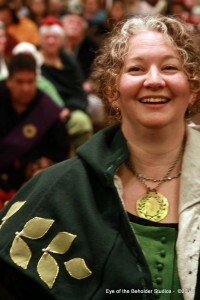 This is the website for Mistress Aneleda Falconbridge, as she is known of in the Society for Creative Anachronism. It contains scroll text, lyrics, original songs and poetry, musings, and occasionally even instructions! She is a Companion of the Order of the Laurel, Order of the Silver Crescent, Order of the Maunche, and Order of the Troubadour. 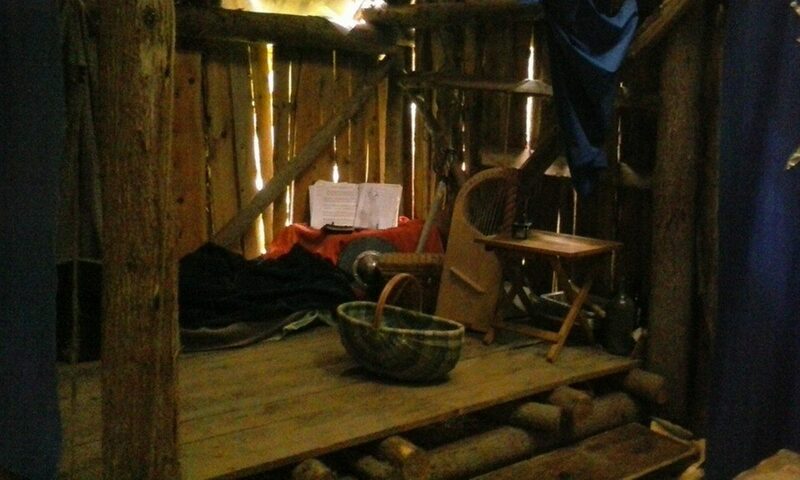 Aneleda enjoys camping with her early-period collective, Noorden Bruggen. Their membership is primarily Norse, Saxon, Celtic, and Mercian, with a smattering of other times and places thrown in. The collective enjoys historic cookery, music, discussion, and modern beverage alchemy. She has been playing in the Society since 2002, her first event being the Great Northeastern War and her second event being Pennsic 32. Aneleda was an apprentice to Mistress Mira Fennor of Argyll and is a member of Thanet House, the household of Mira and Syr Cedric of Thanet. Aneleda’s modern counterpart, Monique Bouchard is a wife and mother, self-proclaimed nerd, SnowCon gaming convention founder, church cantor, and a marketing professional currently working for CourseStorm, a software company in Orono, Maine. Her latest projects can be found at https://falconbridge.bandcamp.com. Her debut CD “I Am of the North” is available for purchase at www.ofthenorth.net. Wilhelm and Viena raised this stone to praise Ulfgeir smith forge-son and leaf-wearer on whom Ivaldi Brok and Eitri smile. Olaf carved. This is the stone being laid out by Olaf. 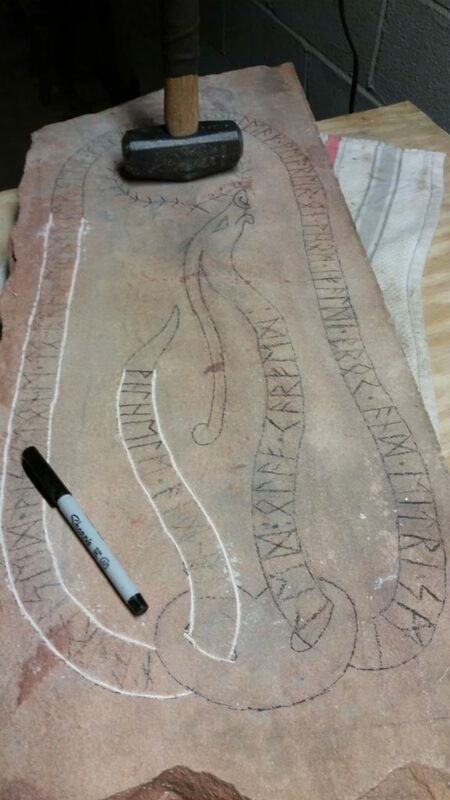 The stone was drawn, then runes placed, then carved by hand, and then painted. In all seriousness, it’s the shortest thing I’ve ever written for an SCA project. Olaf Haraldson carved these words into a runestone for Ulfgir. I had a maximum of 126 characters. Using runes, anything that was doubled would be reduced to one, so there’s a little play. At Court when this was presented, I read a framework for it to give it context and say all the “court stuff” like the event and the date and such, because those are not part of this scroll. I’ll write that down here at some point, but it ended with, “AND THE STONE READ…” and I read the stone. But there’s also a second story. Many Norse runestones list the carver (many, many) and it’s standard. Olaf does not do this typically, because Olaf is modest. However, I added it because it is more true to authentic practice. We disagreed and then compromised: “Olaf carved” would be on the back. However, when the stone was laid out, Olaf sent me a message. It had never happened to him but there were…10 extra spaces. He’d measured and planned precisely (it’s stone after all) but these 10 spaces were just – there. Know what fits in 10 spaces? There came a woman to the court of the East, and all should care to hear tell of her. A match for a hundred workers was this mead-woman, and yet she asked for no wages. Medhbh was the woman’s name, well-attended and generous. She cared for many, first at the request of the Ard Rí, and after, she served many more, moved by fierce loyalty that welled from her as water from a spring. For the space of a dozen years and more she labored. Stout of heart, she took the mantle of leader for her cóiceda, handling grievances and important matters, sharing knowledge of the law, and voicing the needs of her people to the land-chiefs. Red-maned Medhbd traveled often to soldier’s fields, to places where the sea could not be seen in any direction. She helped prepare camps for the chieftains to meet with their people and gather with their warriors. Her bright hands served all with respect, from the roughest shovel-lifter to the gentlest lady, offering a thousand welcomes to each who entered her care. For these things, and more, six pearls from the sea were given to her to wear, gifts from chieftains in her honor. One day, when the winds of Feabhra had blown for twenty-three days, one pearl fell into Medhbd’s lap as she worked. She instinctively cradled the salt-treasure to her breast. When she brought down her hand, she found the pearl transformed to garnet, red as blood and clear as water. Suddenly she was surrounded by many white-winged birds who pulled her toward their flock by their beaks and pushed her with their wings. Thus was Medhbh inghean ui Cheallaigh blessed for her service by the pelicans. Her wages were paid in joy and tears, and she was granted a patent of arms bearing her icons, argent, a triskelion of spirals purpure and on a chief embattled vert three towers argent. It was the fifty-third year, on the day in which Wilhelm Ri and Vienna Ban Ri named the filid who would serve them and placed the new Ruiri in Dragonship Haven. Saerlaith ingen Chennetig wrote and collected it from Athlæða Fálkribrú. This piece is supposed to sound like a Celtic story. I read a lot of early Celtic works to hopefully make it sound right. The last bit IN IRISH (I think): Saerlaith ingen Chennetig ro scrib in leborso ra thinoil a Athlæða Fálkribrú was provided so Saerlaith could enscribe if she wanted to, in Gaelic. To towers white this boldnes is not strange. of Santiago argent, an orle Or. At Bridge Barony’s beloved Black Rose Ball. as to faint hartes this boldnes will seme strange. Nothing here but what in good faith was done. Now knowing this, relish its affection even more. We, Brion Rex and Anna Regina bid all Eastern subjects to note the deeds of art wrought by their loyal subject Lijsbet von Catwick. A woman of great artistic curiosity, she cheerfully explores with great abandon and success. Helpful herbs, crafted clothing, fine foods, shaped sugar, little lamps, hardscrabble houpalands — little escapes her interest. As is fitting for one with a love of arts diverse and sundry, We hereby induct Lijsbet to the Order of the Silver Brooch and award her Arms for her to bear Per chevron inverted urdy purpure and argent semy of escallops purpure, in chief a sea-dragon naiant Or, making her this day a Lady of the Court. Done by Our hand at the Crown Tournament in the Province of Malagentia on the fifth day of November, A.S. LI. Calligraphy by The Honorable Lord Gwillim Kynith, Illumination by Mistress Agatha Wanderer, Words by Mistress Aneleda Falconbridge and **Anna Bijns (1493-1575) Middle High Dutch poem, translated by Kristaan Aercke. From “Women’s Writing from the Low Countries 1200-1875: A Bilingual Anthology” edited by Lia van Gemert. The first time I heard “The Scotsman Song” written in 1979 by Mike Cross, I found it funny. I was young and the idea was kind of hilarious, a turnabout that was unexpected and silly. I mean, who on earth would do that, right? However, I’ve gotten older and I’ve gotten to know many men who wear kilts and who have had many questions about how they’re attired, at best, and have been groped for that discovery, at worst. Add to that that the gent in question is drunk and thereby nonconsensual…well, this song has become Very Problematic for me and I can’t stomach the original because it feels so inappropriate that I can’t find it funny any more. Because it’s still a staple in the Ren Faire world and often performed in the SCA, I decided to write my OWN version, update to embrace the behavior I expect from others. Please, feel free to adopt it into your own songbooks. Then staggered off into the grass to sleep beside the street. I wonder if it’s true what they don’t wear beneath their kilt. So it wouldn’t be too tangled as they they slept in the meadow. Which of the many rumors is the one that is correct. Surely I will tell you since you’ve waited since last night…. (spoken) AHEM. Well, there’s no Scottish Highlander’s Rulebook or anything and this subject is divided even among the most cultured Scots. As a matter of fact, according to a survey* of kilt wearing Scots, a full 55% wear shorts or briefs beneath their kilts. The rest do not. However, it’s worth noting that The Scottish Tartans Authority has decreed that refusing to wear underwear beneath the country’s national dress is “childish and unhygienic” but…. Depending on the kilt wearer, both answers may be right! But depending on the kilt wearer, both answers may be right! And we know more than we did before– knowledge ought be prized! O we know more than we did before– knowledge ought be prized!